See my video demo below of this close up in the tub so that you can see the shimmer. Having Tonka, Jasmine and Neroli, this gorgeous bath bomb epitomizes the “too pretty to use” bath bomb. Looking like a lovely lotus flower, I was pleasantly surprised at the lovely combination of jasmine floral and lovely orangey neroli, with the creamy, vanillary note of tonka bean. I have not had any Lush products with the combination of Jasmine, tonka and neroli. It’s so fragile, that if anyone is having it sent from the UK to the US, it almost always ends up broken. But that’s the risk we take to get our Lush frenzy quelled. In this case it was SO worth it. I find this to be such a gorgeous scent. It’s one of the stronger scented fragrances. I normally don’t like alot of jasmine, and i typically don’t like orange blossom. However, this scent is just gorgeous. I give this bath bomb a 5 out of 5 rating. 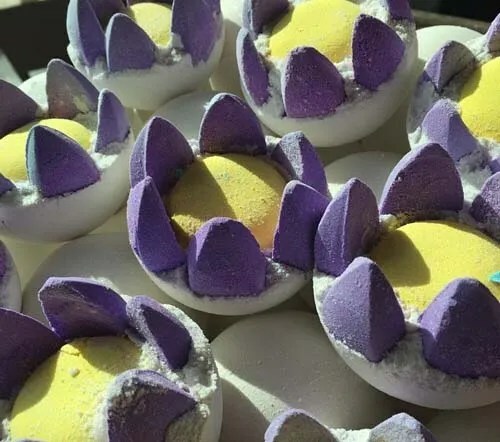 Posted on April 3, 2015 by Lushalot	• This entry was posted in Bath Bombs, Lush Oxford Street store exclusives and tagged jasmine, lush kitchen, lush uk, New, oxford street 2015, sacred lotus. Bookmark the permalink.